Curran International is globally known for its thin film exchanger coating applications to reduce fouling, corrosion, and extending the useful operating life of refinery and petrochemical heat exchangers. Using proprietary application technologies, Curran has become the world leader in tube ID thin film coating, achieving uniform depositions and meeting precise specifications. This system was first demonstrated in the U.S. at a power utility where an equipment failure resulted in accelerate cooling water corrosion of condenser tubing. The utility, together with the Electric Power Research Institute (EPRI), began to research epoxy coatings for tube IDs as an alternative to costly, time consuming alternative methods of repairing their condenser.The study verified the efficacy of tube lining, which proved less susceptible to fouling compared to uncoated tubes. 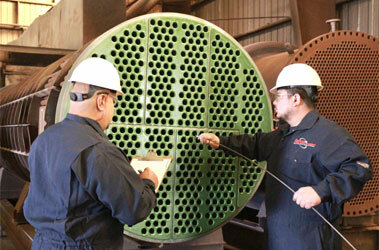 The benefits of tube ID coating are known by refinery and petrochemical clients across the globe. Refinery “bad actor” exchanger bundles were replaced “in-kind” with Curran tube ID coating; fixed equipment specialists recognized the benefits in reduced maintenance, deposit fouling, corrosion, and improved operating reliability as a value added application. Curran is at the forefront of material and application technology development using advanced polymers and inorganic/hybrid coatings. Ultra thin (<25 micron) applications for “critical service” and plate and frame exchangers are in field trials. All applications are subject to Curran quality control and hold points. We coat shell & tube exchanger bundles, air coolers, U tube and plate and frame exchangers; provide in-service exchange tube ID restoration; tube end coating, plate exchangers, OD tube coating; in-situ and field coating applications. 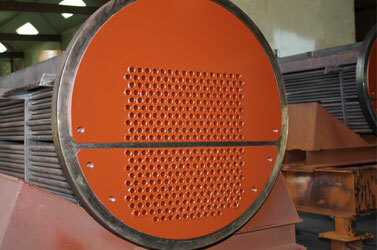 Curran has mastered surface prep and application methods for coating “in-service” exchangers, this technique is used to restore exchangers for continued service. Curran can achieve NACE 1 “white metal” cleanliness of in-service exchanger tubes, and its application methods satisfy holiday spark testing requirements – even in pitted tubes. A homogeneous thin film protective coating mitigates tube ID corrosion. Curran 1000 – Advanced two-part 100% solids epoxy coating designed for high temperature immersion service in cooling water, hydrocarbons and process streams. This coating is an organic/inorganic hybrid with superior mechanical performance; resistant in cooling water steam services to 365°F and excursions to 400°F (204°C). Applied to 8-14 mils total DFT. Curramix 2500 – An ultra-low DFT ambient-cure coating system designed for high temperature fouling services; excellent hydrophobic & oleophobic properties, anti-coking performance, resistant to thermal cycling, and can be used in 1200°F. May be applied to heat exchanger tubes, plate & frame exchangers. Applied to 20-40 microns total DFT. Baked Phenolic – Shop applied, bake catalyzed, suitable for all cooling water services, hydro carbons, salt solutions and solvents. Immersion resistance to 365°F; applied to 7-10 mils total DFT. PFA and PTFE – Shop applied, bake catalyzed fluoropolymers; superior resistance in chemicals, solvents and acids. Immersion resistant to 500°F. Applied to 8-14 mils DFT. 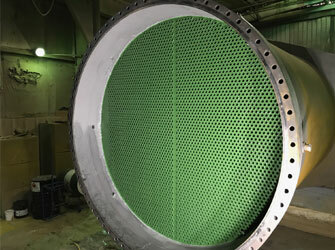 StreaMax™– A Chemours recommended material for Heat exchanger applications, shop applied fluoropolymer; bake catalyzed, uniform adhesion; reduces surface roughness and drag, low friction coefficient. Excellent non-stick and product release, for some services up to 500F. Sol Gel – Ceramic SiO “backbone” hybrid with organic and inorganic components, suitable for plate & frame, and tube bundles in process critical services. Applied to 20-40 microns total DFT. Contact Curran International about your heat exchanger reliability and fouling challenges so we can develop a solution.